We’d love your help. Let us know what’s wrong with this preview of Saving Talk Therapy by Enrico Gnaulati. In recent decades there has been a decline in the quality and availability of psychotherapy in America that has gone largely unnoticed--even though rates of anxiety, depression, and suicide are on the rise. In Saving Talk Therapy, master therapist Dr. Enrico Gnaulati presents powerful case studies from his practice to remind patients and therapists alike how and why traditional talk therapy works and, using cutting-edge research findings, unpacks the problematic incentives in our health-care system and in academic psychology that explain its decline. Beginning with a discussion of the historical development of talk therapy, Dr. Gnaulati goes on to dissect the factors that have undermined it. Psychotropic drugs, if no longer thought of as a magical cure, are still over-prescribed and shunt health-care dollars to drug corporations. Managed-care companies and mental health "carve outs" send health-care dollars to administrators, drive many practitioners away, and over-burden those who remain. And drawing back the curtains on CBT (cognitive behavior therapy), Dr. Gnaulati shows that while it might be effective in the research lab, its findings are of limited use for the people's complex, real-world emotional problems. To ask other readers questions about Saving Talk Therapy, please sign up. This book highlights the rise and fall of traditional talk therapy. The first two chapters go over the beginnings of psychotherapy, starting with Sigmund Freud and moving through the various therapists after him and their contributions to the field. These chapters, I thought, were very interesting, as they show how dynamic the field is and how many changes were made throughout its history, steadily getting more effective in its methods. The next two chapters, three and four, go over the rise of This book highlights the rise and fall of traditional talk therapy. The first two chapters go over the beginnings of psychotherapy, starting with Sigmund Freud and moving through the various therapists after him and their contributions to the field. These chapters, I thought, were very interesting, as they show how dynamic the field is and how many changes were made throughout its history, steadily getting more effective in its methods. The next two chapters, three and four, go over the rise of the first anti-depressants, the most famous being Prozac starting in the 1980's, and the introduction of more scientifically measurable treatment methods like cognitive behavioral therapy (C.B.T.). The author describes how the first anti-depressants like Prozac and Xanax exploded onto the scene, apparently curing depression in people left and right, and making quite a lot of money in the process. This leads up to the current situation in America, with most people with depression, or depressive-like symptoms, on some sort of medication. On top of this, more scientifically built therapies that cut down on the more personal face-to-face interactions, like cognitive behavioral therapy (C.B.T.) or acceptance and commitment therapy (A.C.T. ), are introduced to quickly and efficiently reduce therapy visits and cure the patient. The fifth chapter goes over how new therapists are being trained within the new realm of therapies that include the methods mentioned above, and how the traditional trust-building of therapist and patient is being played-down. 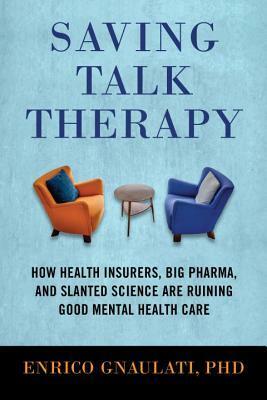 While the last three chapters explain the importance of real talk therapy, with examples from the author's own experiences, along with small explanations and the importance on building a rapport with their patient(s) to help the healing process, the growth of the therapist's expertise and wisdom, and the importance of natural human connections. Overall, I did like this book. The author certainly makes his case for making connections with patients through a long, healing dialogue. To get people to speak about their innermost thoughts, feeling, ideas, and so on, to really examine what is bothering them and why. As someone who has went through therapy, I can attest to this method. To be able to talk to someone with a non-judgmental and open point-of-view who can help you re-frame your experiences, is very important for the sorting-out of your mind and life. The author likes to point out how good of a therapist he is, which in itself is not totally a bad thing, except that he did it enough times for me to take real notice. This was also coupled with the amount of times he brings up the subject of money and how much the therapist should be paid. A therapist is engaging in a very difficult procedure and should be paid for it, I totally get that, no question, and he brings this up at the end of the book. It's just that he is also seems very much against the "scientifically measurable" therapies like C.B.T., for example. He says that they are there to get the patient fixed asap and has statistical significance so that those methods can be perfected and the therapist trained accordingly. All this leading to less human connection and less billable time for the therapist. I do agree with the genuine human connection, that connection with my therapist helped immeasurably and I see his point, what I don't agree with is his apparent anti-science stance he makes from time to time. One therapy he brought up is M.B.S.R., or mindfulness based stress reduction, which is a highly successful (and scientifically measurable) therapy started in 1979 by Dr. Jon Kabat-Zinn. Though I haven't personally engaged in this therapy, if you read enough books on the psychology of stress and/or trauma you will come across this method, and it is a very highly recommended method which has helped many people. My therapist had me work with acceptance and commitment therapy (ACT), along with talking, and the ACT methods helped me quite a lot. I'm not quite sure why these "quick fix" therapies are so bad, they're just (in my opinion) different perspectives which, depending on the patient, help them get to the core of their problem. Sure, one person should use ACT and not CBT, or CBT and not MBSR, and so on, but they are there to help the patient sort out their issues. Granted, he does mention how some therapists do use the science-based methods along with talk therapy, mixing them in and not just using them exclusively, and that's great. But the author treats them as if they are just another form of medication. Maybe it's just me, but in his tone of writing in this string of issues I noticed, they connect together to produce a profile of a guy who is self-promoting himself a bit too much and who wants to get paid a lot and frequently. Less pills, less "scientifically based" methods, and more billable in-the-chair time with him. I could be COMPLETELY off the mark here, but these things rose up as I was reading and I thought I would voice them out and see if anyone saw this too. Would I recommend this book? If you are interested in mental health care, YES, I would definitely recommend this. Yes, I wrote a rather long rant about that narrative I saw running through the book, and I apologize for the length, but ignoring all that, the book is really interesting. I do agree with most of what Dr. Gnaulati talks about: we are a very social, collective species that needs that natural, living connection between our fellow human beings, and talking is a major part of that connection. We in Western culture have become more and more fragmented from each other, and having trusting, fulfilling relationships helps balance ourselves out. Therapy should not be made up of pills and forms to fill out, it needs to be a honest, open, and trusting dialogue. Saving Talk Therapy attempts to go a step further than books like The Emperor's New Drugs and Comfortably Numb in arguing that not only is the over-reliance on psychiatric meds a harm to the psychiatry and psychology fields, but also in that new empirical-driven techniques such as CBT (cognitive behavioral therapy), DBT (dialectical behavioral therapy) and ACT (acceptance and commitment therapy) are also furthering the erosion of benefits of traditional talk therapy. I liked the background given Saving Talk Therapy attempts to go a step further than books like The Emperor's New Drugs and Comfortably Numb in arguing that not only is the over-reliance on psychiatric meds a harm to the psychiatry and psychology fields, but also in that new empirical-driven techniques such as CBT (cognitive behavioral therapy), DBT (dialectical behavioral therapy) and ACT (acceptance and commitment therapy) are also furthering the erosion of benefits of traditional talk therapy. I liked the background given to various types of talk therapy. When I hear the words "traditional talk therapy" I picture Betty Draper lying on the couch with a completely detached man listening and then later telling her husband all about her "hysteric" condition, all the while not providing her with one microgram of help. The author does a good job of explaining the different types of therapy (analysis, existential therapy, etc.) and how they don't all boil down to Betty Draper's unhelpful analysis sessions. I did not find the evidence against CBT, DBT and ACT to be particularly compelling. The author mostly uses anecdotes, although he admits that the very reason that CBT and the like have caught on so much is their ability to be empirically tested in research studies. It therefore comes as no surprise that there is no evidence to suggest that one method of therapy may be more useful than others (especially the types of therapy that are so difficult to test). The arguments used against CBT are in how many people seek follow-up care, and for how long people see a therapist. I suppose some may argue that fewer therapy sessions are a good outcome; others could argue the complete opposite. In addition, any correlation between these statistics cannot be taken as evidence of any causation. Therefore, I'm not convinced that CBT and its many related therapy types are ruining therapy. Saving Talk Therapy advocates what Freud established as psychotherapy. The author is a fan of Freud which anyone in the psychology profession might be. But he fails to mention the disservice Freud my have done to psychologically healthy women who were experiencing physical symptoms of hysteria. In my opinion as a patient, talk therapy is a very legitimate treatment method. However I have participated in both talk therapy and evidence based practices and I have benefited from both. Discounting an Saving Talk Therapy advocates what Freud established as psychotherapy. The author is a fan of Freud which anyone in the psychology profession might be. But he fails to mention the disservice Freud my have done to psychologically healthy women who were experiencing physical symptoms of hysteria. In my opinion as a patient, talk therapy is a very legitimate treatment method. However I have participated in both talk therapy and evidence based practices and I have benefited from both. Discounting anything other than talk therapy to the psychiatric practice is doing a disservice to many people who may respond to other methods. I first heard gnaulati on npr's "On Point." I felt that his defense of traditional insight – oriented psychotherapy was spot on. I also thought that his critique of the state of affairs in cognitive behavioral therapy was spot on. In this text, he continues this argument against vapid and quite limited psychotherapy practices. As a private practitioner who struggles to keep his doors open given the practices outlined in this book, the author does highlight holes and misinformed practices that are I first heard gnaulati on npr's "On Point." I felt that his defense of traditional insight – oriented psychotherapy was spot on. I also thought that his critique of the state of affairs in cognitive behavioral therapy was spot on. In this text, he continues this argument against vapid and quite limited psychotherapy practices. This was a very interesting look at mental health care. Fascinating talk on the current mental health system and how we got here. Interesting look at our mental health care system.